Until you’ve stood next to one of the behemoth cranes, haul trucks, and hydraulic shovels used in the mining industry, you simply can’t appreciate the scale of these machines. Some of these modern engineering marvels weigh hundreds of tons, and all must be operated with great care to avoid accidents. Heavy equipment typically has numerous safety features including multiple fail-safes and operator warning systems. Many of these safety features are based on pressure sensor technology. The hydraulic systems of heavy equipment have sensors that detect changes in pressure and convert these changes into an electrical signal that is relayed to the operator through a dial, gauge, monitor or other instrument that indicates the pressure in units of your choice. A visual and/or auditory alarm goes off if a particular pressure safety range is exceeded. A crane outrigger is one of the large “feet” at the base of the crane supporting it. Pressure sensors in crane outriggers alert the operator to decreasing pressure in the outriggers, which could mean the ground beneath part of the crane is collapsing. Pressure sensors also reside in hydraulic booms, constantly measuring the boom’s load to ensure it is within capacity to avoid dangerous tip-overs. A pressure sensor measures pressure at several locations in the boom and sends a signal using a load-moment indicator to warn the operator if the load is too heavy. Sensors also can help improve operational efficiency by telling an operator if the load is too light, which means more can be loaded onto a truck. Multi-ton haul trucks and other heavy mining machines also have pressure sensors embedded in the rear suspension to prevent overloading. These sensors can detect overloads both at initial loading and if the load shifts during transport, warning the operator to take steps to avoid a tip-over or loss of load. 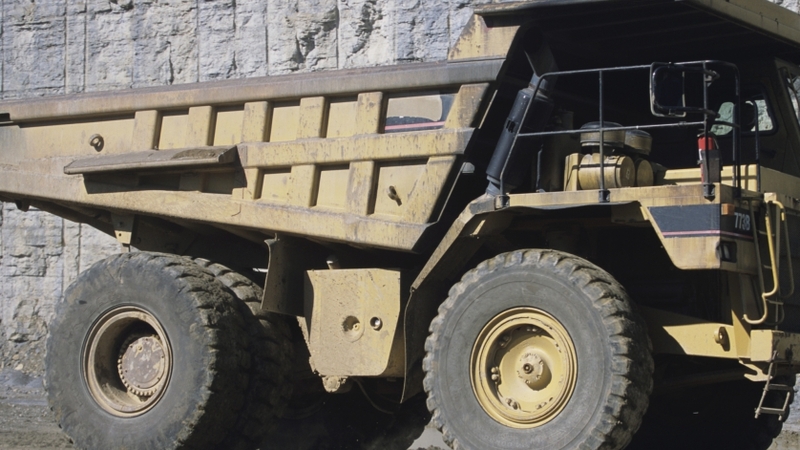 The pressure sensors in mining heavy equipment must be robust, reliable and accurate. WIKA’s Mobile Hydraulics series offers pressure sensors specifically designed for the rigors of the mining industry. The entire line of MH sensors has been built from the ground up to be highly resistant to shock and vibration, electrical interference, temperature variation and water ingress. Each pressure sensor is hermetically sealed and manufactured with a highly stable sputtered Wheatstone bridge. Many types of mining equipment create significant vibration and shock in normal use. Haul trucks, cranes and hydraulic shovels are frequently used off-road, inevitably leading to punishing shocks no matter how good your suspension system is. The pressure sensors embedded in the hydraulics of these vehicles must be able to withstand constant shock and vibration. Mining sites are found in all climates, so mining equipment must be designed to operate across a broad range of temperatures. This means all electronic components, including pressure sensors, must be completely sealed and tested for functionality in hot and cold temperature extremes. WIKA’s MH pressure sensors also undergo hundreds of hot-cold cycles as part of our reliability-testing process. Water ingress is another major issue affecting pressure sensor reliability. Heavy mining equipment typically endures wind, rain, snow and wash-downs with high-pressure hoses. Hence all pressure sensors in mobile hydraulic applications should be hermetically sealed so the pressure sensor will keep working even if there is water ingress or condensation in the hydraulic unit.